We know how much all of you love talking about Material Design, so here is a heads up for another app which has received an update with Google’s latest app design guidelines. 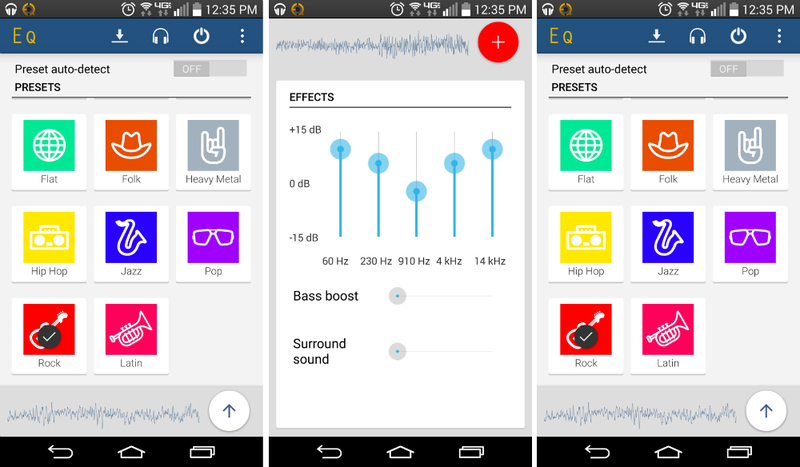 Equalizer, Google Play’s most popular audio equalizer app for Android, received an update to version 4.0 this week, which includes a slick UI upgrade to Material Design. Equalizer allows users to place an EQ preset on any audio coming out of your headphone jack or speaker. Think of it as a system-wide EQ, instead of one just used for when music is playing. One shining feature of Equalizer is its ability to brilliantly detect the type of music you are listening to, automatically adjusting the EQ preset all by itself, without the user needing to touch a button. For example, if you are rocking out to metal, it will set itself on the Rock EQ. If you are jamming Bach or Mozart, it selects Classical. This feature is only available with certain music player apps, but don’t worry, Google Play Music, Pandora, and almost all other major players are supported. Go check out that Material Design in action. New material design for Equalizer! Easier and more intuitive controls.